Hair extensions can be applied to the natural hair in several ways, the most popular methods of which include clamping, weaving and fusion. The fusion method of applying hair extensions calls for adhering extensions to natural hair with a glue or polymer wax. This technique is also known as "bonding." There are two types of fusion methods; hot fusion and cold fusion. The cold fusion method of applying hair extensions uses a Keratin based bonding adhesive. This method is said to be more gentle than its predecessor, hot fusion, which uses glue. Cold fusion bonding, which uses a clear polymer adhesive, does not require heat. The application process includes sectioning off the hair and lifting a few strands of natural hair to work with. The extension hair is then placed underneath the natural hair. Once the natural hair and the extension are in line with each other a small bead of Keratin wax is pressed into the extension and the hair, toward the root. While some stylists simply press the wax bond closed with their fingertips, others use a cold fusion gun to compress the layers together and create a strong bond. Some extensions come with the a prebonded tip. When properly cared for, cold fusion hair extensions can last up to six months. Hot fusion, also called bonding, is a traditional method of gluing hair extensions to natural hair. This method uses heated glue to adhere the strand extensions to the hair. To attach the extension, a small adhesive bond strip is wrapped around both the hair and the tip of the extension, near the scalp. The strip and hair is then compressed with a hot fusion gun. 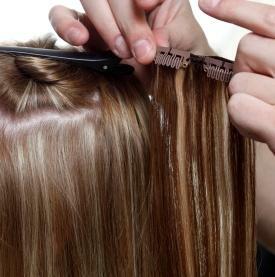 The heat causes the bonding strip to become sticky, which in turn 'bonds' the hair together. Hot fusion extensions will last between four and six months. One of the most common ways of weaving extensions into the hair is by creating a horizontal braid close to the scalp and sewing the extension into the braid or "track. " This method, which uses weft hair extensions, is also called a cornrow weave. The technique calls for a large curved needle and thread that matches the hair. Of all the hair extension techniques, this one may be the most time consuming. Expect a cornrow weave to last between four and six weeks. Clamp hair extensions refer to the method of using tiny clamps to hold extension hair into place. Clamp hair extensions can use small beads, rings, copper tubes or 'links.' The locked extensions are created by looping strands of natural hair through a small, bendable bead, clamp or ring. Strands of the extension hair are then pulled through the tiny ring. When the clamp is pressed closed with an extension clamp, which resembles a pair of pliers, it securely locks the hair in place. To remove this type of hair extension, use nail clippers to break the clamp open. Be sure to avoid cutting your own natural hair. These extensions can last two to four months. This method is a non-invasive and temporary way of adding extensions to your natural hair. Clip on hair extensions come as wefts of hair that are pre-attached with snap-like hair clips. The wefts of extension hair simply fasten to the natural hair using the clips. If you have very fine hair, experts recommend that you backcomb your hair at the roots before applying the clipon extension. When it comes time to choose which of the hair extension techniques is right for you, consider how long you'd like to keep your extensions. You'll also want to consider your budget, since some techniques can be more costly than others.